It’s a small, four-letter word that you’ve been told leads to nothing but financial trouble. Most of the time, the picture associated with debt is that of the person who went out and purchased a multitude of goods with a credit card that he or she can in no way afford. And while that truly is a bad form of debt, it’s not the only kind of debt out there. In fact, without debt, almost no one would be able to buy a house, pay for college, or buy a car. Sometimes debt allows people to purchase the things they need that they’d be unable to afford if they merely relied on saving alone. Debt doesn’t always have to harm you. 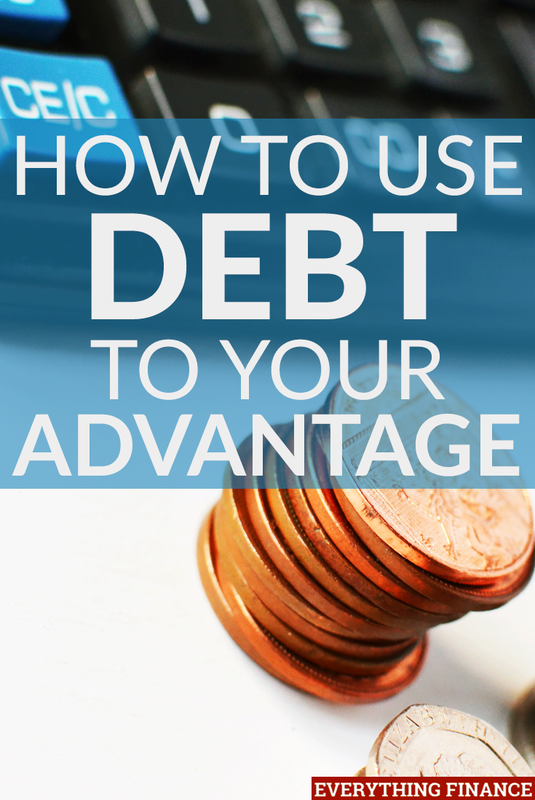 Here are some examples of how you can strategically use debt to your advantage. Although it’d be wonderful to have school paid for by your company, or by receiving a scholarship, most people I know had to pay for school themselves. And in the 21st century, not having an education isn’t really an option for most careers. Thankfully, you don’t have to win the lottery to pay for school. Instead, you can apply for and enlist the help of student loans. While you may hear complaints concerning student loan debt, student loans can be a good type of debt. By receiving a higher education, you are more qualified to obtain better and higher-paying jobs, and therefore, you should have a higher income in the future. In most cases, you don’t have to start paying student loans off until you actually graduate with your degree (as long as you stay enrolled each semester). Instead of thinking of your student loans as something that will loom over you, think of them as an investment that you’ll reap the rewards of in the long run. If you plan to rent a home or apartment, or buy a car, you’re going to have to build a good credit history. The only way to build good or excellent credit is to have debt at some point. Whether you decide to take out a loan or use a credit card, you’ll have to purposefully acquire some sort of debt to get your credit history started. Of course, this also means that you’ll have to pay that debt off in a timely manner. But keep in mind that utilizing a credit card to build credit doesn’t mean you should go out and buy a bunch of things you can’t afford. It’s those situations that cause bad debt instead. If you’re trying to build interest on a savings account, the goal is usually to leave that money alone and allow it to build over time. Unfortunately, life happens, and there are often things you need that may cause you to dip into that money. Thankfully, credit cards can be a great way to help you purchase various items without sacrificing your savings. Then, once you’ve been paid, you can pay off the credit card instead of trying to rebuild that savings account. Of course, you must be wary and be sure to pay the credit card itself off before allowing it to build up too much interest, as that’s what can lead to trouble. The only time I’ve used credit for these types of purchases is if I can obtain a very low interest rate or a 0% interest promotion that I know I can pay off in full. Usually, if debt means furthering your career, most people would consider it a good thing. If you’re hoping to go to work for yourself or start your own operation of some sort, there’s likely a multitude of things you’ll need to get started. These things usually don’t run cheap. For many, purchasing equipment or various inventory isn’t something they can throw on top of all their other monthly expenses. This is where good debt comes in. A smart choice is to take out a business loan, which gives you the ability to make purchases short-term. Taking out this type of loan will give you the opportunity to get your business up and running, which will give you the ability to begin making money. If you had to wait to save up the money yourself, this is a career move that may never happen or at the very least, it would probably take you much longer to accomplish. In this particular sense, accruing some debt is definitely to the advantage of your career. Utilizing debt to purchase income property can be extremely beneficial to you in many ways. The first, and most common form, is taking out a loan in order to purchase a home. Unless you are exceptionally wealthy or win the lottery, I’m guessing you don’t have the ability to purchase a house completely on your own. That is where a mortgage comes in handy. Not only will you have a wonderful new place to live, but you’ll also receive some of the financial benefits that come with having a mortgage loan. First and foremost, your mortgage interest is tax deductible. Furthermore, while you may feel the teeniest bit of dread when your mortgage payment is due each month, remind yourself that you’re building equity, and as time goes on, you can use that equity as a potential source of funds if need be. Lastly, as time goes on and you put care and effort into your home, there’s a good chance that it could be worth more than what you originally paid. So, if you ever did decide to move or downsize, you have the potential to make a profit. While debt tends to receive more bad press than good, you shouldn’t automatically be turned off by the idea of having any debt. Yes, you should eventually pay all debt off, but acquiring certain kinds of good debt is what can help you get started in life. It gives you the power to further yourself in your life as you go to college, buy a car, or purchase a home. For most people, debt is a necessity at some point in life, and if used the right way, debt can even be advantageous. How have you used credit to your advantage? What are some tips you might have? Your post is so interesting, Student loan is now more buzzing. Its excessive payment become burden for student. You are trying to expose your view by sharing this post providing some method to pay off loan payment. It’s really very helpful. I am really touched.